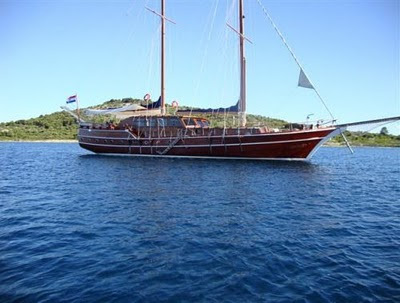 25% off on all charters booked and taken between April and July 2011. ELEGANZA was originally made for private use and can accommodate up to 10 passengers (optional up to 12 passengers). She has 4 spacious double cabins, one master cabin and one single cabin. The interior gives the feeling of a classic wooden yacht. With her excellent sailing possibilities and various choices of sails, as well as being a luxury cruiser, she can turn into a sailing yacht during windy days to experience the thrills of sailing. All cabins are beautifully appointed with paneled mahogany joinery and doors. Each cabin has individually controlled air-conditioning units (cooling/heating). Saloon is equipped with TV, DVD, music system CD & MP3, PC, Internet access, emails and internet fax. Decks are large and comfortable which clients can enjoy in shade or in the sun while sun-bathing. The Aft deck has its own sitting area great for taking a rest or reading a book on comfortable aft cushions. The well-protected aft cockpit is a fine place to dine, under the awning or under the stars, and can accommodate up to 10 people. Spacious sun-deck is equipped with 10-12 cushions for sun-bathing. Four professional crew (Captain, Deckhand, Chef and Stewardess) provides excellent service and a good atmosphere. They will help you find the local specialties and offer any assistance or advice.